Accu-Glass solves the volumetric, liquid handling and flow control needs of medical device manufacturers around the world. 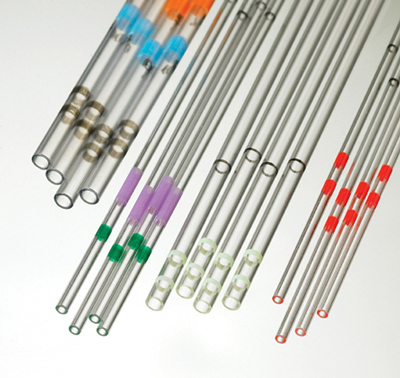 We produce a wide range of precision glass tube products that include capillary tubes for collecting and dispensing specific volumes of blood and other liquids, flow restrictors/regulators for mobile infusion pumps and flush devices, and ampoules for urgent care applications. Our numerous clients in the medical, laboratory, Point-of-Care, fiber optic and electronic component industries have come to rely on upon Accu-Glass as a trusted resource. 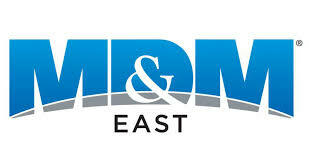 Commitment to quality engineering and service is our strength. 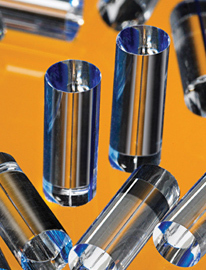 Glass flow restrictors are utilized in many applications where an exact flow rate is needed. Glass flow restrictors are used in medication infusion pumps where they assure that the patient is neither over nor under medicated. Glass flow restrictors are also used to meter gases and to control the flow of saline in flush devices used in hemo-dynamic monitoring systems. Glass is commonly used as it is inert and does not interact with drugs as do other materials such as plastics. It is also dimensionally stable and will not change size or configuration during sterilization, storage or further processing. Micropipettes where a liquid is drawn into a tube with a predetermined volume and then dispensed as a known aliquot. Small blood collection tubes which are used to draw blood from a finger stick.